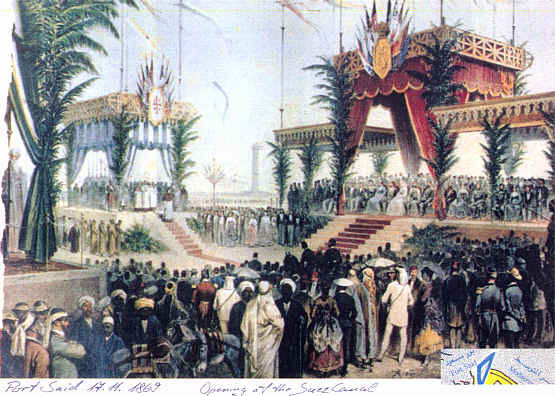 1869 Opening of the Suez Canal at Port Said. Related Story: Aida is an opera in four acts by Giuseppe Verdi to an Italian libretto by Antonio Ghislanzoni, based on a scenario written by French Egyptologist Auguste Mariette. It was first performed at the Khedivial Opera House in Cairo on December 24, 1871. Ismail Pasha, Khedive of Egypt, commissioned Verdi to write the opera for performance in January 1871, paying him 150,000 francs, but the premiere was delayed because of the Franco-Prussian War. Contrary to popular belief, the opera was not written to celebrate the opening of the Suez Canal in 1869, nor that of the Khedivial Opera House in the same year. Verdi had been asked to compose an ode for the occasion, but refused on the grounds that he did not write "occasional pieces". Text Source: Wikipedia. Photos, Documents, Books and Stories from the Panamacanal Construction.